Grizzly Bear wrestling, lava boarding. Catching snow flakes on my tongue. Saturday, August 10th—Kishwaukee River Wade Outing. We will meet at the Cherry Valley Café at 8AM for breakfast and to split up into wading groups. 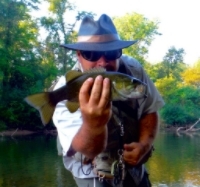 This is a good time of year to wade as the water is warm and water levels average lower levels. Saturday, July 13th—Apple River Wade Outing. The Apple River is located in the driftless area in the most Northwestern part of our state. Due to the size of the river this will be a RSVP outing. Please contact Paul Trybul 815-540-7775 to reserve your spot. http://illinoissmallmouthalliance.net/calendar/event/861-nwr-kishwaukee-river-float-outing/ Please comment here if you plan to attend. Saturday, April 13th—Kishwaukee River Float Outing. We will meet at the Cherry Valley Café at 9AM for breakfast and to work out shuttle details. We will be close to north, south and main branches of the Kishwaukee River with several options depending on how long of a float you want to do. March 16 NW Region Breakfast Meet - Cancelled due to lack of interest. Sorry for the late notice. We're at the Cherry Valley Cafe this month. Click on the link above for more info. Let me know. I have the same problem with a pair only lasting a season two at most. I just figure it's because I use them constantly and they never really get a chance to dry out. Maybe try going over the seams with a small bead of shoe-goo when you get a new pair and before you use them. I'm about at the point of just buy two pair of cheap hiking type boots at wallmart. It's best to buy your tickets in advance as soon as possible. Tickets sales really increase the last two weeks heading in to the Blowout. Hope to see you there! Even if Tim doesn't show? Happen to know if Jude is up for breakfast this Saturday? Sorry to hear that. Hope all goes well. Let us know. Lynx Fishing Log seems like it's pretty good.